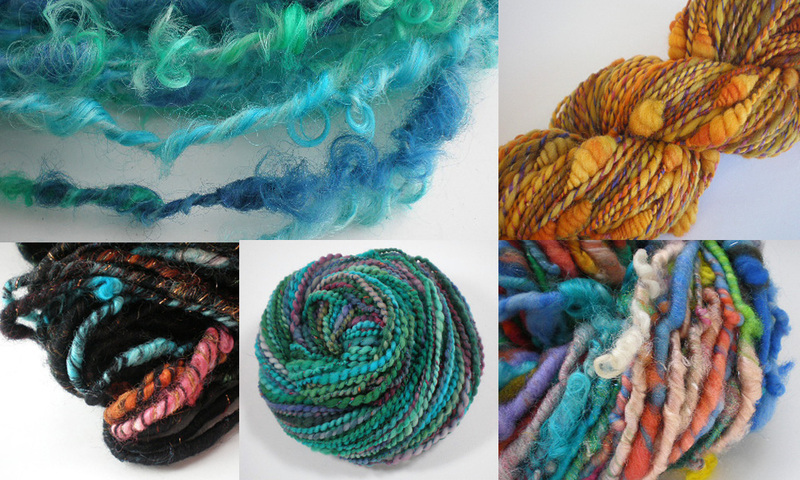 Daily Fiber Adventures with Wildhare | Knitting, Spinning, Fiber Art Fun! When I started ‘Daily Fiber Adventures with Wildhare,’ my intent was to post my progress in spinning/weaving/fibery things on a daily basis. Well, that didn’t happen (facebook and other social media took that role). The name actually worked in reverse, in that I continued to procrastinate about posting, and guilt over expectations, and other nonsense of that sort. So… its time for a new name, a new blog, and finally, a new post! I do hope you will migrate on over and follow me. No promises or expectations in regards to how often I post — but I am intending, when I do blog, it will be something good and worth your time! 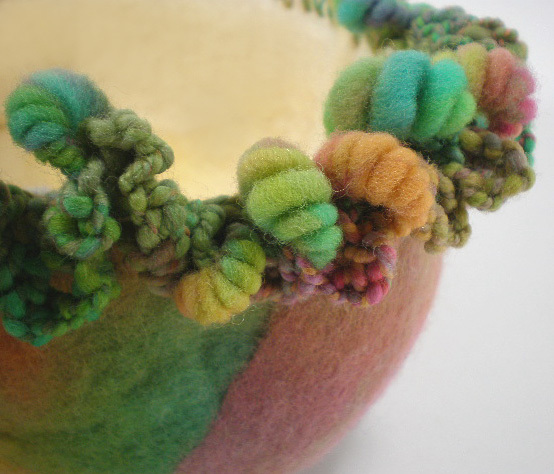 Now, for some fun, upcycled, woven holiday ornaments to get this new blog going! One more row, one more row, one more row! Yes! I did it! That ambitious schedule of fall festivals is now successfully complete! It was a long ride there and back (eight hours including meal and gas stops) and I went packed to the max — even strapped a 15 cubic foot carrier stuffed with wool to the top of my SUV (that came back empty, fortunately). Will I do it again? You bet! I’ve already put in for 2011. My attention now returns to my online shop, and I’ll be listing lots of new things as I unpack and regroup from the festivals. Though I may be doing a few Holiday shows… still lining things up in that department. Sept. 11 – Ballston Arts & Crafts Market off Glebe Road in Arlington VA, 9 a.m. – 4 p.m. A general, juried outdoor crafts festival in a lovely setting on a square downtown. Sept. 18/19 – It’s Worldwide Spin in Public Day! 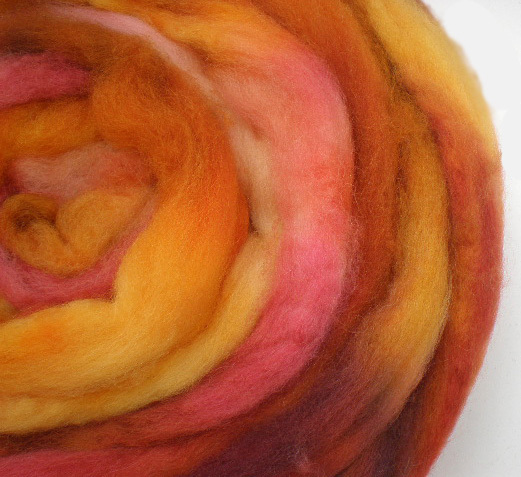 I’m hoping to spend some time as a member of the Blue Ridge Spinner’s & Weaver’s Guild spinning at The Bluemont Fair. The guild has had a tent at this event for years, demonstrating a whole range of fiber crafts and selling handmade items (lots of lovely handwovens especially). This is a full-fledged fair, with all kinds of activites for all ages – located in the foothills of the Blue Ridge mountains less than an hour outside DC. 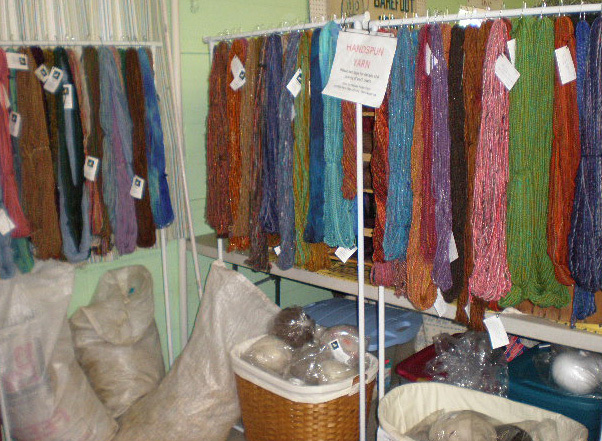 Sept. 25/26 – It’s the Shenandoah Valley Fiber Festival in Berryville VA! One of my favorite festivals, in a lovely setting. 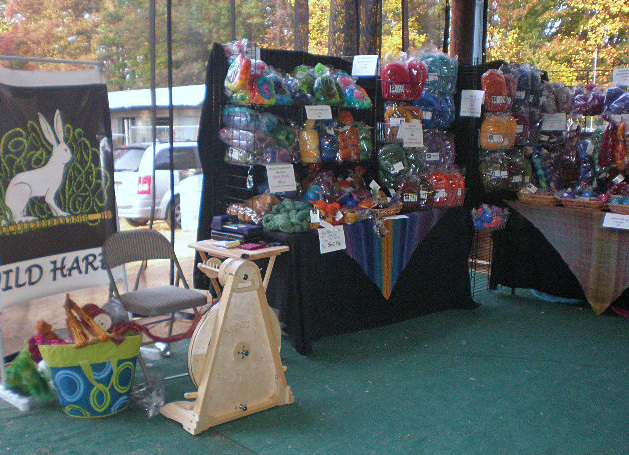 I’ll be returning as a vendor this year with a double-sized booth, for twice the space to display hand-dyed yarns and spinning fiber, handspun yarns, wheels and tools, felting kits, etc. This festival has been growing by leaps and bounds (but still isn’t overwhelmingly big). My booth will be in the ‘Arts & Crafts” building, spaces 7 and 8 (most of this event is under cover, so come rain or shine). Don’t miss this one if you can get there! Oct. 2/3 – Another good one! 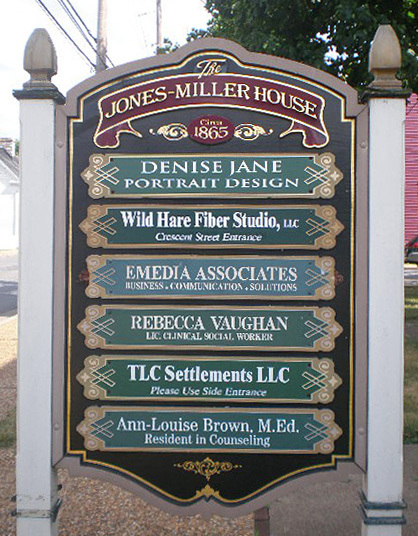 The Fall Fiber Festival at Montpelier, in rural VA just north of Charlottesville. This outdoor festival is on the lawns of the Montpelier Estate, and features sheep dog trials as well as animal and fiber displays. Look for me in one of the big white tents. 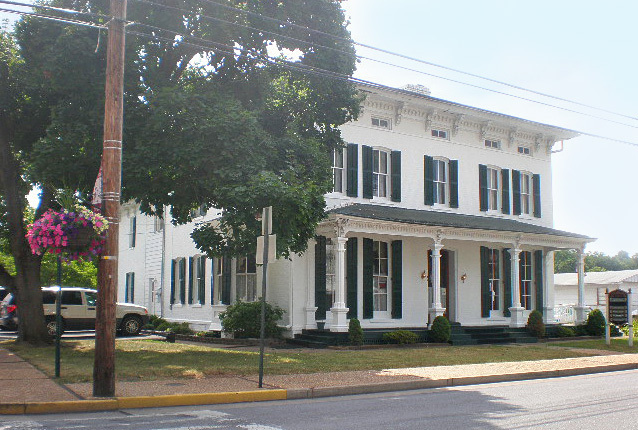 Oct. 9/10 – The Festival of Leaves, Front Royal VA. I have only to step outside my studio doors to be right at the heart of this event, sponsored by the Warren Heritage Society (located across the street). This is a general festival, with lots of music and vendors of all kinds, including a special ‘Heritage Village’ featuring traditional crafts on the grounds of the Heritage Society. I’ll be by my studio, spinning and vending under my own tent (or in my studio should the weather turn bad). Oct. 16 – I’ll be at the The Capital Region Etsy Street Team’s 1st Annual Falling for Handmade Craft Fair in Bohrer Park, Gaithersburg MD, which will feature 50 Local Etsy Artistians joining together In Real Life to showcase and sell their handmade products (a great time to start your Christmas shopping – there should be something for everyone, even pets!). 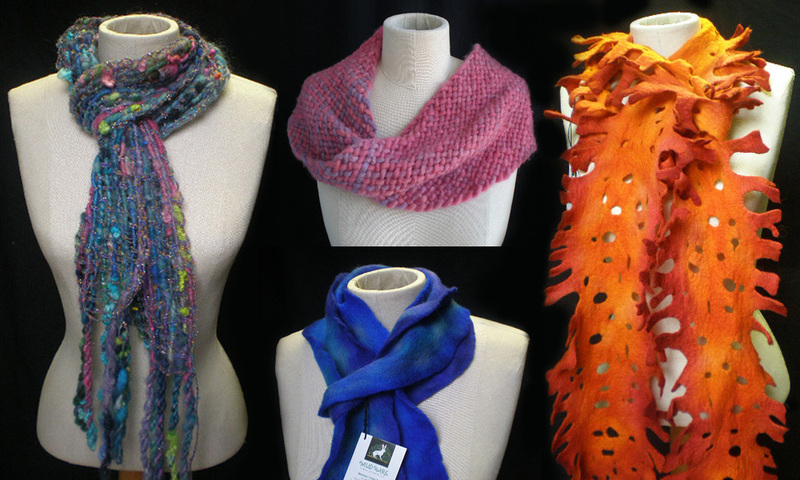 I’ll be at the Southeast Animal Fiber Fair (SAFF) in Asheville, NC, on October 22,23 and 24th for one of the largest festivals on the east coast. Somewhere in the maze of animals and vendors, you can find me in the ‘sales arena,’ booth 15 (which is located in one of the four corners of the building). I’m getting excited just thinking of this one! Okay, my entrance isn’t anything special — but the good stuff is inside anyway! 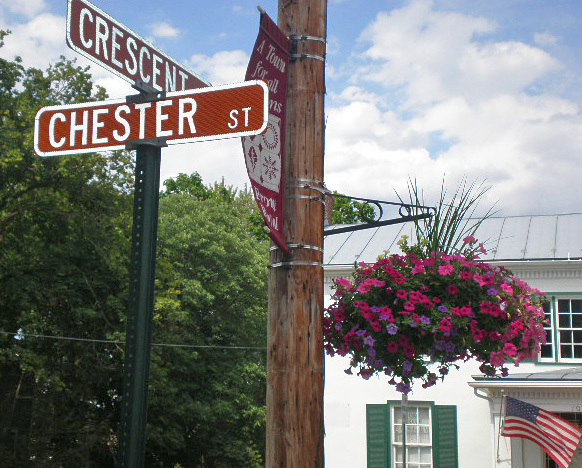 The new location is just a quick walk from Main Street in Front Royal, which features some lovely antique and specialty shops and unique restaurants as well as the twice-a-week Farmer’s Market and a weekly outdoor music event. 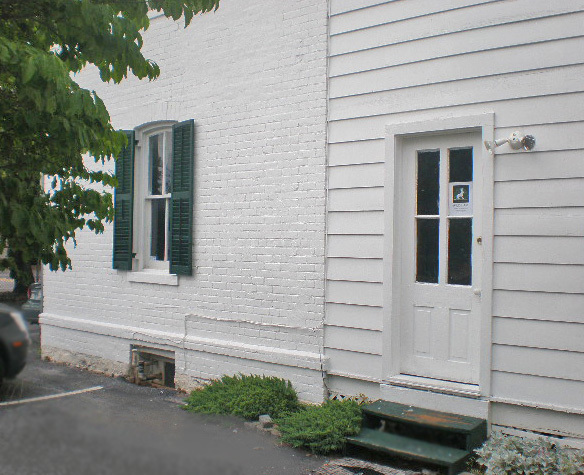 The address is 106 Chester Street, but my entrance faces Crescent Street. 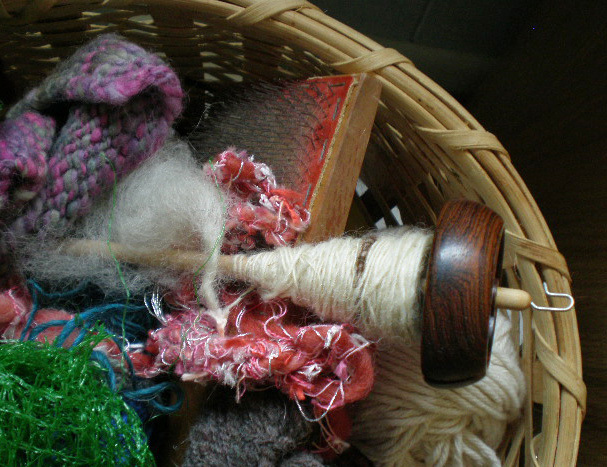 Beginning July I will have a schedule of ‘open studio’ hours and knit & spin nights that will be announced by the beginning of each month. 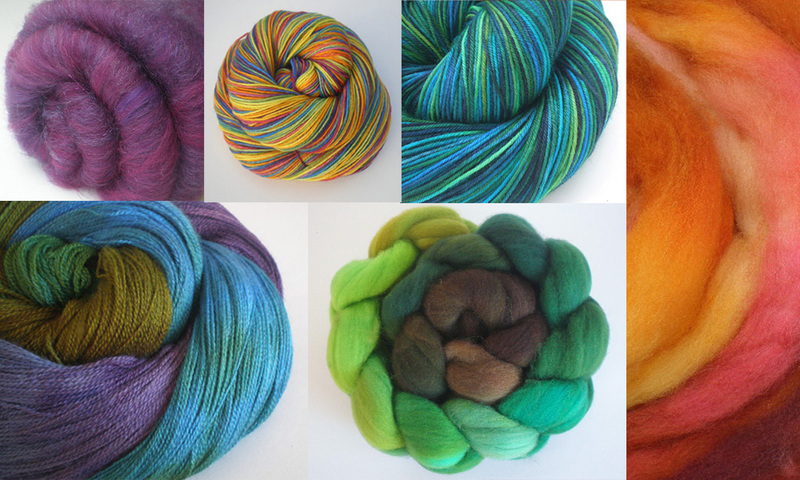 In addition to my own hand-dyed and handspun yarns and fibers, I will also be gradually adding quality yarns from selected US mills. 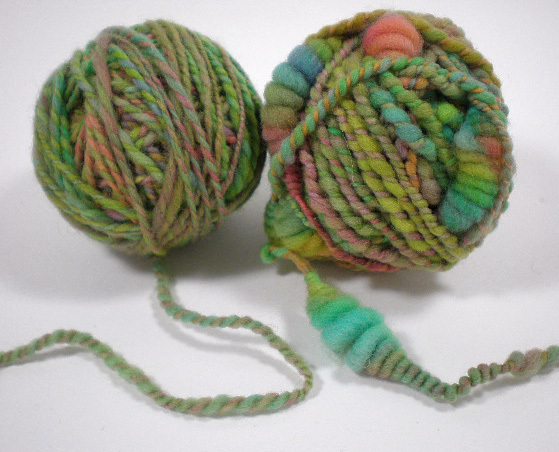 Saturday July 3 and 24th, 10 a.m. – 2 p.m.
Wed. July 7 and 21, 7-9 p.m.
Knit & Spin Nights on Friday July 2 and 23rd, 7-9 p.m. If you’d like to visit at some other time, please call or e-mail me — I’m just around the corner and happy to open by appointment as well! 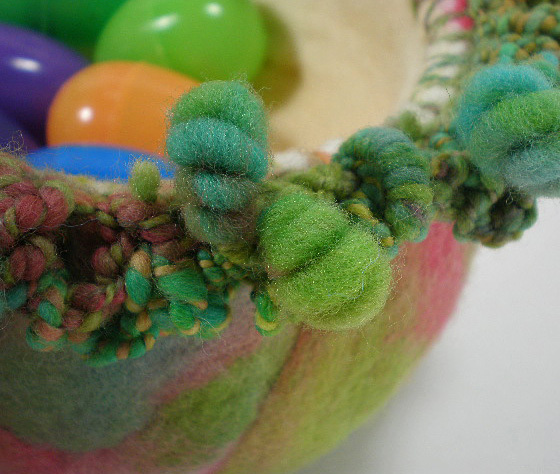 So how does a pile of dyed wool turn into an egg-shaped bowl with funky edging? 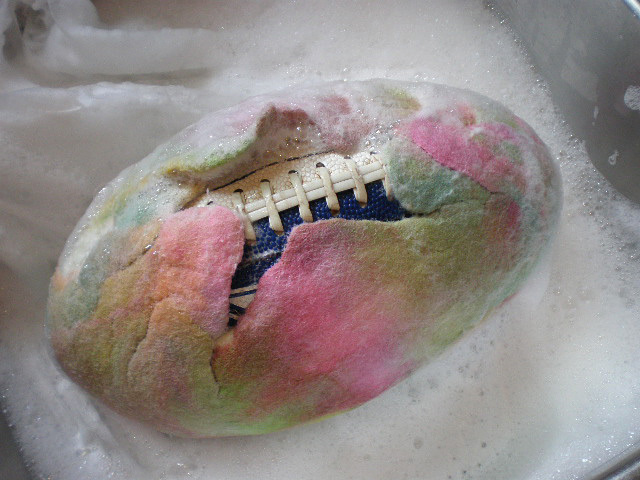 It all started when I asked my ten-year old if I could borrow his football. Setting aside his sceptism and concern for a precious possession , he brought it to me, after first making me promise that it would not be Harmed in any way. 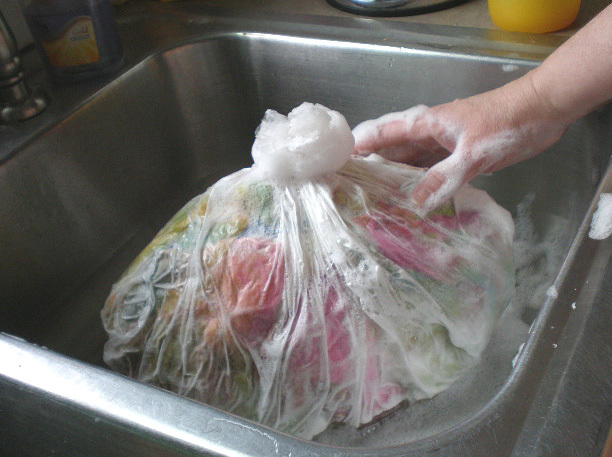 ‘It will be fine, just a lot cleaner.’ “You’re weird, mom.” Okay, what else is new. 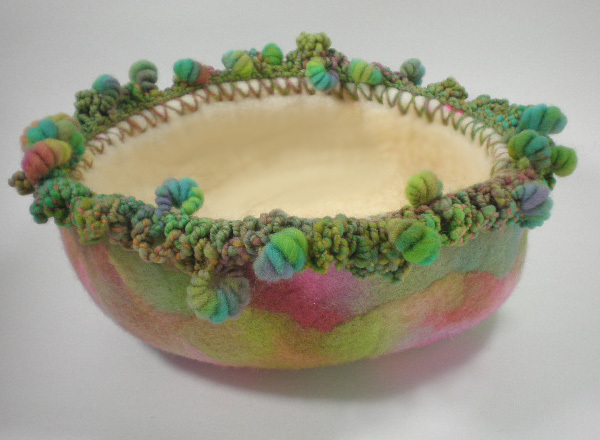 To create an edging on the bowl, I first used a large tapestry needle to make a row of holes around the top. Using the plain yarn and a small latch hook, I put in a row of single crochet. Switching to the coiled yarn, I went around twice with loops of chain stitch, letting the coils dangle. Now it’s weird enough – and done! 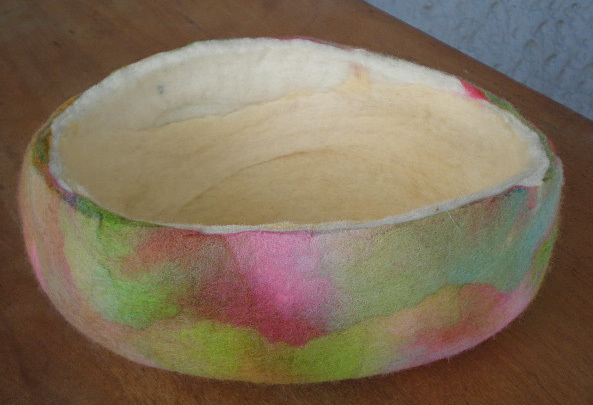 And next Easter, we’ll have an egg-shaped bowl in which to keep those dyed Easter eggs! Chelle on 8/28/08 – Here she is!